Shari’ati’s residence moved across different neighborhoods in Paris as he explored different faces of the city and enabling him to develop the many dimensions of his ideological, religious, political, spiritual, intellectual and cultural identities. He lived in different apartments with friends, landlords, and his family who later joined Shari’ati. His apartments were home to Shari’ati’s reflection on and analysis of his host country, education and educators, new acquaintances and companions, and all his socio-political activities. Upon his arrival in Paris on 25 May 1959, Shariati's first residence in France was at Kazem Rajavi's apartment, an old acquaintance from Mashhad. Reference: Shari'ati, Susan. Beresad beh Dast-eh Pūrān-eh Azīzam. Tehran: Ābān, 1394, p. 19. This location serves as a real and fictive address. This is where he meets Solange Bodin, a real person, from whose name, being, and behavior Shari‘ati creates a semi-fictive character, a lonely angel (play on words Seul Ange = Solange), an archetype of perfection and purity, a mystical figure of unwanted exquisiteness, who drowns at sea in Tourville. Here we have a mysterious love affair between Shari‘ati and Solange, the two were like open books to one another. Solange could represent a real person whom Shari‘ati was in love with, in a part worldly and part mystical manner. She could also represent that purely mystical genre, in Iranian Sufism or Gnosticism that shifts the life of Truth-seeking mortals and puts them on the track of attaining the heights of the Sufi quest for uniting with the Divine. Thus, Shari‘ati tells us that Solange was like a Shams to Mowlavi. This apartment was the locus of the relationship. Reference: Shari’ati, Ali. Hobūt. Collective Works, Vol. 13, pp. 333-335. / Shari’ati, Ali. Goftegūhay-eh Tanhāī. Collective Work, Vol. 33/1 pp. 226, 228, 297, 302, 304-305, 308-309, 310-311, 434. / Shari’ati, Ali. Goftegūhay-eh Tanhāī. Collective Work, Vol. 33/2 p.980, 1159. / Rahnema, Ali. An Islamic Utopian: A Political Biography of Ali Shari’ati. I.B. Tauris & Co., 2014, p. 89, 169-170. In August 1959, after having left Monsieur Bodin’s apartment, Shari’ati moved into a tiny room of 4-meters by 1 and a 1/2-meter, which Shari’ati called a closet. This room had a window to the street, which usually brought in the sound of music, neighbors laughing or quarreling, and the noise of cars instead of light. His neighbor was a friendly, kind African whom he would frequent. He attended French courses at Alliance Française and Institute Pantheon while residing at this address. Reference: Shari'ati, Susan. Beresad beh Dast-eh Pūrān-eh Azīzam. Tehran: Ābān, 1394, pp. 53-54, 56, 125. 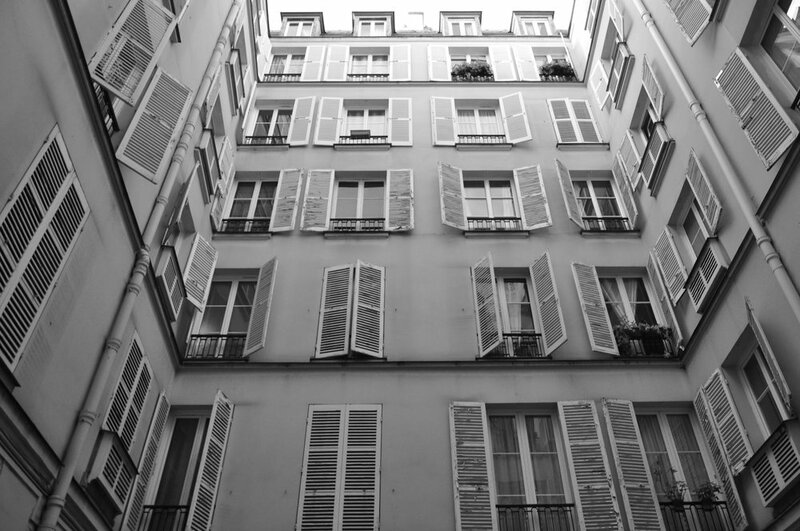 Shari’ati describes three Iranian students in this apartment near Champs-Élysées whom he claimed to have known very well. One was pseudo-pious (Moqadas-eh moab) who did not dance, never passed by a cabaret and did not eat meat, as it was not properly slain (was not halal). The other was a handsome worldly man. He loved wine, women, and dancing and left everything other than these three to his friends. His nights were like the Thousand and One Nights. His bookshelves were filled with a variety of wine bottles and his agenda was filled with the phone numbers and addresses of women of all human races. The third had neither the religion of the first nor the worldliness of the second. His beloved was a memory that warmed his body. He was in deep thoughts, books in hand, and his heart in love with freedom. The third student was Shari’ati himself. He moved into this apartment with two Iranian friends, which he described having three large rooms, on September 10, 1959. Reference: Shari’ati, Ali. Goftegūhay-eh Tanhāī. Collective Work, Vol. 33/2, p. 1065-1067. / Shari'ati, Susan. Beresad beh Dast-eh Pūrān-eh Azīzam, Tehran: Ābān, 1394, pp. 58-60. Reference: Rahnema, Ali. An Islamic Utopian: A Political Biography of Ali Shari’ati. I.B. Tauris & Co., 2014, p. 92. Sharia’ti took residence in this apartment when he moved from his Montparnasse apartment. This apartment served two purposes in Shari‘ati’s writings. First, it was one of the apartments in which Shari‘ati lived. Thanks to the post-card he sent to Akbar Safaviyeh, we know that this apartment did exist in reality. The second purpose of this apartment is part fictive and part real. In his self-psycho-analytical writings Dialogues of Solitude (Goftegouhāy-eh Tanhāie) he engages in considerable and unprecedented self-disclosure and self-exposure of his state of mind and feelings. This type of personal audacity and forwardness was most uncommon among the intellectuals of his time and his background. Shari‘ati intentionally uses a good dosage of allegory and metaphors, to impart to his inquisitive readers what he wishes them to grasp, without providing direct information that would implicate him. He intentionally veils what may be reality, but we will never know for sure with fiction, fantasy, and sometimes myth. Reference: Shari’ati, Ali. Hobūt. Collective Work, Vol. 13, p. 483. Note: A friend of Shari’ati, Akbar Safaviyeh, showed Rahnema a postcard Shari’ati had sent to him back in April 1960 from Paris, according to which the address was 14 Rue Lacroix, not 15 Rue Lacroix. This is the same apartment mentioned in Chandel’s story. 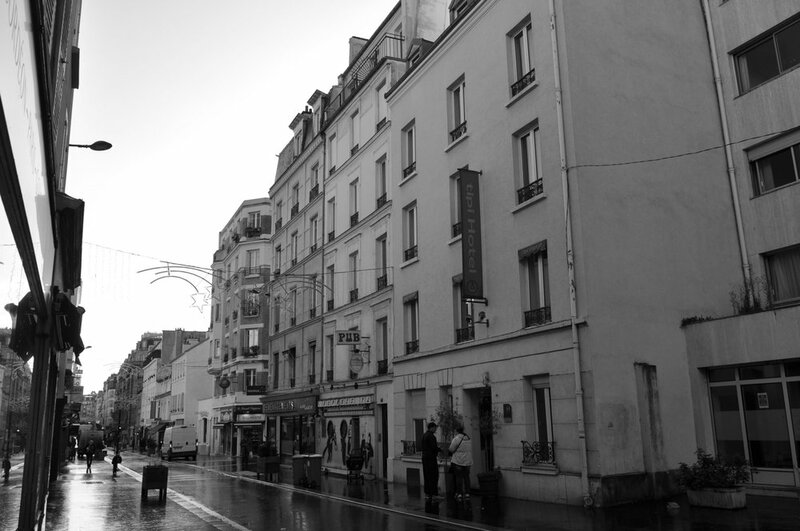 However, Shari’ati wrote that Chanel’s Apartment was at 15 Rue Lacroix. Shari’ati moved into this apartment in Fall of 1960 with his family after spending the summer break in Mashhad. Reference: Rahnema, Ali. An Islamic Utopian: A Political Biography of Ali Shari’ati. I.B. Tauris & Co., 2014, p. 94. Note: In 2015, Rahnema contacted Susan, Ali Shari’ati’s daughter, to inquire about the building number. Susan found the address on a letter sent from this address. Many Iranian students from Khorasan lived at this hotel. It was common for students to live in small hotel rooms in the 1950s and 1960s, according to Naser Pakdaman, as the monthly rent at a hotel was cheaper than renting an apartment. Note: In January 2018 Pakdaman told Maryam he believes that Shari’ati may have lived here and most likely frequented this hotel.